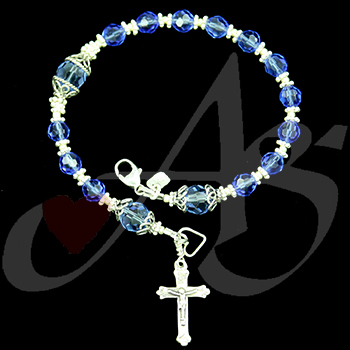 Beautiful Marian rosary bracelet with sterling silver accents. Enjoy! Beautiful sparkly Swarovski and Chinese crystal rosary bracelet with sterling silver embellishments. I really like end caps - I should remember to use them more often! Every time I do, I am always amazed with "wow I really like that look!" LOL Gorgeous spiritual weapon of prayer - Mary pray for us! Enjoy!